From Dutch Homestead to Dairy Farm Estate: The Van Allen / Vygeberg Property ~ The History Girl! Set back on the corner of Ramapo Valley Road and Franklin Avenue in Oakland, New Jersey, is a small, stone home with a tattered tarp on its gambrel roof. Closer to the road, to the eyes of a layman, is an old building with holes in its façade, missing windows, and a deteriorated roof. These two buildings may not seem significant to the casual passer-by, but little do they know that these buildings represent significant periods in American history. It was a mere 235 years ago that General George Washington temporarily used the then-home of Hendrick Van Allen as his headquarters on July 14 and 15, 1777. The home’s history begins in 1748, when Hendrick Van Allen, his wife Elizabeth, and their ten children moved to what is today Oakland. Hendrick was a deacon at the Ponds Church, which was located approximately one mile west of his home. The stone masonry home that Hendrick built consisted of four rooms. Its architecture reflects the Dutch design of the period. By the time of the American Revolution, maps made by American cartographers for the war show that in addition to his home Hendrick had also established a grist mill across the road from his home. Ramapo Valley Road, now Route 202, served as a main supply route and access road for movement north and south in the colony. On July 14, 1777, Washington and his troops were headed north from Morristown and he ended his march toward Sussex due to the inclement weather and nearly impassable road conditions. Washington stationed his troops outside the Van Allen home. During his stay at the Van Allen home, Washington wrote three separate correspondences. Hendrick Van Allen lived in the home with his wife and children until his death in July 1783, at the age of 76. Van Allen’s property was divided amongst his children. Records indicating the ownership of the property between 1788 and 1864 are illegible. Between 1864 and 1900, three other families owned the property. In 1900 the property was transferred to Edward Page, a successful merchant and businessman. Edward Day Page was born in Haverhill, Massachusetts in 1856, but by 1860 was living in South Orange, New Jersey with his family. Because of his father’s business connections, Page became a partner at the wholesale dry goods firm Faulkner Page & Co., located in New York. Page began his employment as an office boy and became a full member of the firm in 1884, eventually working his way to senior partner. The business continued until December 1911. 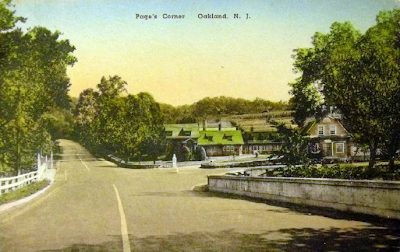 Edward Page’s purchase of the property in 1900 corresponds with a period in the region’s history when many wealthy New York merchants and industrialists moved from the urban centers to the rural countryside and modern suburbs of northeastern New Jersey. The 700 acres of land that Page purchased became the Vygeberg Estate, which he built for himself and his family. The estate was a working farm that encompassed almost all of the Mountain Lakes section of Oakland. Seeing the need for fresh dairy products in Oakland, the farm was primarily a dairy farm with several cow barns. As part of the estate, Page constructed a family mansion, known as De Tweelingen, barns and other necessary outbuildings, including the Vygeberg Office (Stream House), which was built in 1902 on the Van Allen House property. The Vygeberg Office’s construction reflects the influences of Dutch Colonial Revival architecture of the early twentieth century at its roofline, symmetrical facades, the use of masonry stucco to mimic stone, and the front gambrel roof, which was more prominent in revivals of that period than their original precedents. The basement and first floor of the Vygeberg Office were used for dairy storage and farm operations while the second floor served as residences. A unique feature of the building is that a stream runs through the center of the building. The building was designed around the stream for the purpose of dairy storage. The Van Allen House was also part of the Vygeberg Estate. It served as the home of the farm manager, Alexander Ross, his wife and two children. Research indicates that the home may have also been used as a dining hall for the farm workers. Page belonged to a number of organizations and served several elected positions in Oakland including councilman from 1902 to 1908, mayor from 1910 – 1911, recorder in 1912 and as vice president of the Board of Education in 1913. Page passed away at his home in Oakland on December 25, 1918 at the age of 62. After his death, the Van Allen House property changed hands a number of times through the middle of the twentieth century and appears to have largely been a rental property for most of that period. In 1957, the deed for the property was transferred to Knoll Top Construction which planned to demolish the buildings and develop the site into a gas station. At the urging of former mayor Alexander Potash, who lived in the house from 1938 to 1944, the Borough of Oakland purchased the Van Allen House in 1966. The house was added to the State and National Registers of Historic Places in 1973. The house had undergone many renovations and alterations since 1748 and major restoration work was performed in 1979 in an attempt to return the home to its earlier incarnation. Smaller, mostly undocumented restoration projects took place in the 1990s and 2000s in an attempt to preserve the home. Today, the roof over both sections of the home constantly leak and have caused severe damage to the plaster. Based upon research, the Vygeberg Office was last occupied by tenants in the late 1950s. Since then, the building has mostly been vacant, subject to numerous occasions of vandalism, and controversy regarding its stability, future use, and available funding for restoration. The building has received a certificate of eligibility for inclusion on the New Jersey State Register of Historic Places. Emergency stabilization funding was issued in 2002 and the work completed by 2008, however the building still suffers from missing façade, windows, and a damaged roof. The Ramapough Conservancy has recently been attempting to raise awareness for the site and has is applying for grants to replace the Van Allen House roof and further stabilize the Vygeberg Office until a large-scale fundraising campaign can be established. A historic preservation plan for the property was completed in 2011 and presents a plan to preserve the property for future generations. My Brother Everett lived 3 houses up on Franklin Ave for many years. I know people in Oakland desire to see this property preserved. I believe the State Historic Preservation Office should do much more than it is presently doing.